BlackBerry announces Z3 for Indonesia | BlackBerry Blast! BlackBerry announced a new phone for the Indonesian market at the Mobile World Congress in Barcelona. The new BlackBerry Z3 is a full touch device that will be targeted for Indonesia. The Z3 is a BlackBerry 10 device with a 5 inch display and "long lasting" battery. The Z3 is expected to retail for less than $200. Mobile World Congress 2014, Barcelona � BlackBerry Limited (NASDAQ: BBRY; TSX: BB), a global leader in mobile communications, today announced the BlackBerry� Z3 smartphone, a new all-touch BlackBerry� 10 smartphone designed with Indonesian customers in mind. Made for the next generation of BlackBerry customers in Indonesia, and customized with local apps and content, the stylish new BlackBerry Z3 smartphone features a modern design with a 5� display, long lasting battery and comes with BlackBerry 10 OS version 10.2.1. �BlackBerry is beloved in Indonesia and its loyal fans have made it a popular smartphone brand. This is why we are so proud to be able to help bring BlackBerry even closer to Indonesia with a fantastic product that will be accessible to even more Indonesians. This is only the beginning of what we know will be a long and fruitful partnership between Foxconn and BlackBerry,� said Terry Gou, Founder and Chairman, Foxconn. � BlackBerry� Hub � The ever present BlackBerry Hub lets you access all your work and personal email, BBM�, text messages, social media updates and notifications in one place, with the ability to �peek� into the BlackBerry Hub from anywhere, so you�re always only one swipe away from what matters to you. The Hub can be customized to identify priority messages and to filter the message list by various criteria that you can then activate with a simple pinch gesture. � BBM � BBM on the BlackBerry Z3 smartphone includes all the latest features of the popular mobile social network, customized for Indonesians. You get BBM voice and video chatting with Screen Share and support for BlackBerry Natural Sound, letting you hear nuances and variations in tone in a BBM Voice chat, and making the conversation sound like you�re in the same room. BBM Channels features a variety of Indonesian channels as well as a package of BBM stickers that have been specially designed by an Indonesian artist. � BlackBerry Keyboard � The BlackBerry Keyboard learns what words you use and how you use them, then offers them up to you so you can type faster and more accurately. It gives you the best Bahasa Indonesia typing experience on a touchscreen, complete with multi-language support that lets you type in up to 3 different languages at the same time. � Time Shift & Story Maker � The BlackBerry Z3 smartphone�s astonishing Time Shift camera feature lets you capture a group shot where everyone is smiling with their eyes wide open. You can also use Story Maker to bring a collection of photos and videos together, along with music and effects, to produce an HD movie that you can instantly share on YouTube. � BlackBerry 10 Browser � The BlackBerry 10 browser sets the industry benchmark for HTML5 performance on smartphones, and is incredibly fast, with fluid and responsive scrolling and zooming. The browser includes many advanced features, supports multiple tabs, lets you browse sites privately, includes a reader mode, and integrates with the platform for easily sharing content. You can even save web pages for later viewing. � Instant Previews & Reply Now � Be more timely and responsive with Instant Previews that bring BBM, SMS and email message to you no matter what you are doing on your BlackBerry Z3 smartphone. You can even reply to your BBM or SMS messages in any app, or swipe to the BlackBerry Hub to respond. If you get a phone call that you can�t answer right way, you can instantly silence the call and send a Reply Now response through BBM, SMS or email to let the caller know you�re busy. � Fast, Easy Sharing � The BlackBerry Z3 smartphone learns how you share and who you share with, helping you reduce the number of steps and amount of time it takes to get your files, photos, or documents to where they need to go. Touching �share� in any app provides suggestions on who and how to share your files based on who you�ve shared with in the past, and the feature only gets smarter the more you use it. � FM Radio � The new BlackBerry Z3 includes a built-in FM radio. You can listen to local FM stations, which does not require any network connection. 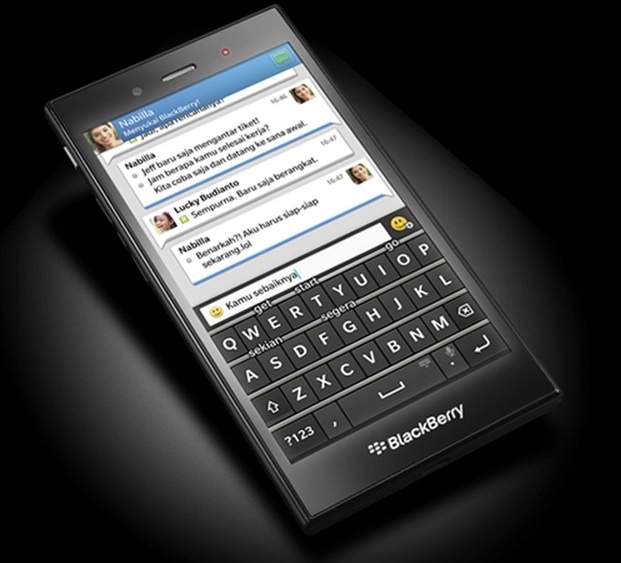 The new BlackBerry Z3 smartphone is expected to be available from leading carriers and retailers in Indonesia in April. Further details on pricing and availability will be announced at launch. For more information about BlackBerry 10, visit http://www.blackberry.com/blackberryz3.